This will pull the robopaas/rosdocked-kinetic-workspace-included container to your laptop and start it with access to your X server. Once you are inside the container you will have everything that is needed to test and play around with the two projects we are currently working on, namely robot navigation and pick&place. Both of the projects are based on the hardware we recently acquired. The hardware is our SUMMIT-XL Steel from Robotnik, equipped with a Universal Robots UR5 arm and a Schunk Co-act EGP-C 40 gripper (see a picture of the hardware below). Besides this, we mounted a Intel Realsense D435 camera on the UR5 arm and two Scanse Sweep LIDARs on 3D-printed mounts. 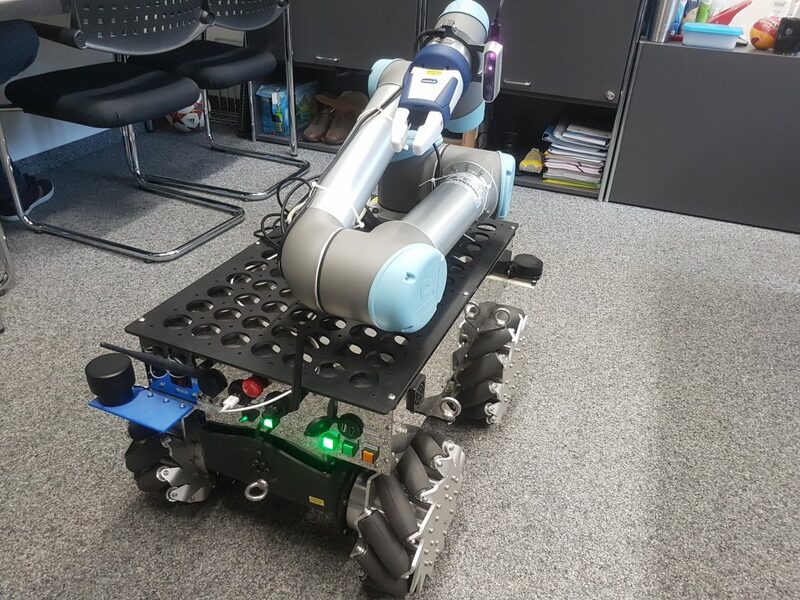 Please have a look at our previous blog post for more details about the robot setup and configuration. A Gazebo simulation environment will be started with an indoor simulated scenario where the Summit_xl robot can be moved around. Additionally Rviz will be launched for visualization of the Gazebo data (see picture below). 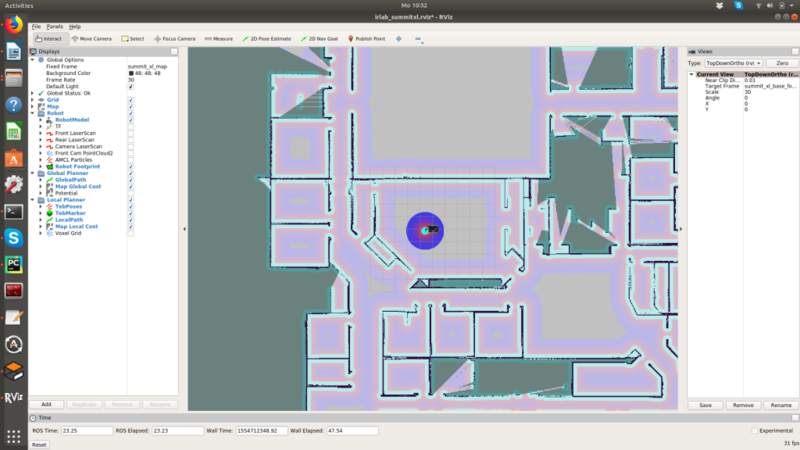 By selecting the 2D Nav Goal top bar option in Rviz it is possible to give a navigation goal on the map in Rviz. The robot will start planning a path towards the goal, avoiding obstacles thanks to the environment sensing based on the LIDAR scans. If a viable path is found, the robot will move accordingly. 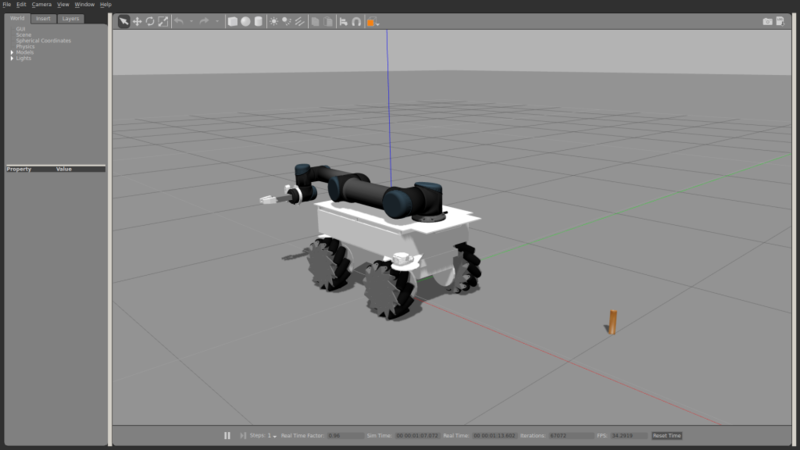 Also in this case a Gazebo simulation environment will be started, with an empty world scenario with the Summit_xl robot and a sample object to be grasped placed in front of the robot (being the deployed gripper opening as small as 1.8cm the selected object is pretty small). Also Rviz will be launched for visualization of the Gazebo data (see picture below) with Moveit being configured for the arm movement. 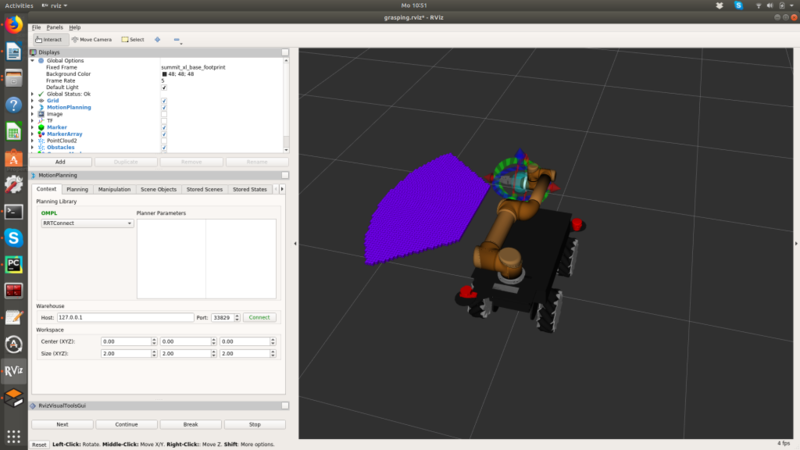 As visible from the Rviz visualization picture above, an octomap is configured for collision avoidance in the arm movements. The octomap is built based on the pointcloud received from the camera mounted on the arm. A first simple test to see the UR5 arm moving, is to define a goal for the end-effector of the arm and make moveit plan a possible path. If a plan is found it can be executed and see the resulting arm movement. The python script will move the arm towards an initial position so that the object to be grasped can be seen with the front and the arm-mounted cameras. A pointcloud will be built based on the pointcloud from both cameras. Based on the resulting pointcloud, the object to grasp will be identified and a number of possible poses will be found for the gripper to grasp the object. Then moveit will look for a collision-free movement plan to grasp the object. 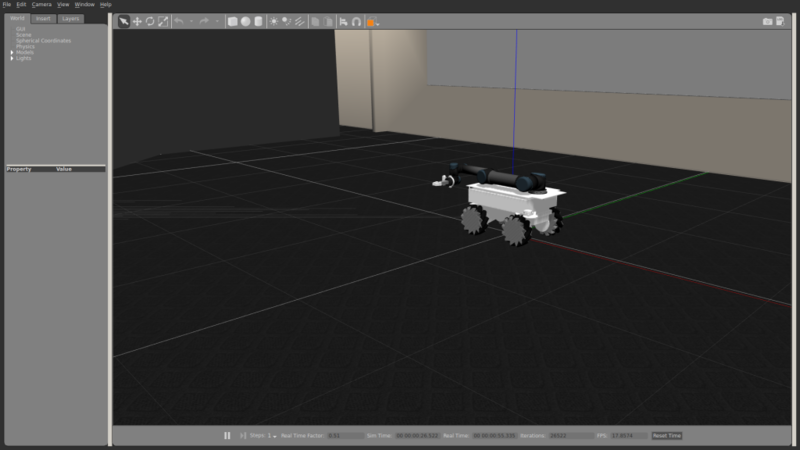 If all of these steps are successfully executed, the object will be grasped and a new movement plan will be computed for placing the object on top of the robot (note that this last step might require some more time as we are adding orientation constraints to the object placement). You can watch a video of our pick&place simulation you can perform with our project below. This entry was posted in *. * and tagged autonomous driving, grasping, iccla, navigation stack, robotics, ROS, Summit by milt. Bookmark the permalink.